Together with classroom training and instruction, Air Cadets will eventually find themselves in the air with one of our instructors for the very first time. Often inspired by their initial familiarizations flights, Air Cadets in level 3 and in Grade 9 or higher, can take additional courses to prepare them to earn their Glider Pilot Wings, officially designating them as a licenced pilot with Transport Canada. There is a selection process for the annual Summer Training program that takes place through the central gliding location housed at Trenton air force base. 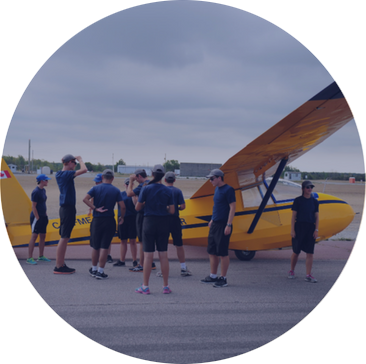 Through these courses, Cadets will take enriched training in ground school and on gliders – including solo flights – in order to be judged as meeting the requirements of Transport Canada for their licence. It is not unusual for many of our Air Cadets to receive their Glider Pilot licence before they have a Drivers licence!